Last week I got my first more official business mail and I was terrified to write back. It got me thinking about how a lot of us might feel when they open a business when your first language isn’t English. As many of you might have guessed by now I’m not a native English speaker. I’m originally from the Netherlands and my first language is Dutch. There are not that much Dutch speaking people in this world and not every single one of those will be interested in my content. 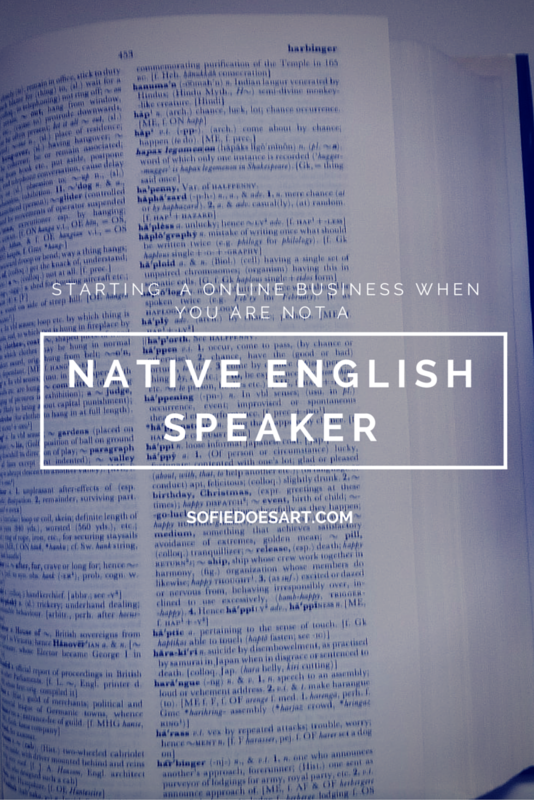 So to reach more people I decided to blog and do business in English. I think that there are a lot of people who did the same thing as I did. I encounter a lot of people who are from different countries. So to help everybody out I decided to make a post about how I experience this and what my top tips are for people in the same position. I am quite lucky in the fact that I can read English without a problem. When I was younger I also had to wait for the translation of books in series and at one point I was so impatience that I started to just read the English version. I don’t translate the texts in my head, I just know the meaning so I like to think I’m close to being almost as good as an English speaker at this. Grammar and spelling wise, however, I am terrible. I can’t even spell in Dutch. Luckily WordPress editor has a spelling check and a proofread option. Even if I know the meaning of words in a sentence, it does not mean I can use them correctly. To make sure I keep my texts readable and understandable I like to check the next few things while writing. If you want to use fancy words that have very specific meaning then do check the meaning and if you can use it in a sentence. The implications that you are making can be entirely different from what you meant to say. I can not spell definitely without a spellings checker. I tend to just make a jumble of letters that kind of resemble the word. A word that does also resembles definitely is “defiantly”. One of them means for sure, the other means in a rebellious matter. When I auto-correct I sometimes choose the incorrect one. So when you are spelling a word do check if what you spelled correctly is what you meant to spell. Otherwise, your texts can become defiantly confusing (see). Than & then. To & too. All of these are confusing to me and confusing to a person who’s first language is English if you get them wrong. Sometimes your mistake is obvious but you can also end up saying something entirely different. I think there are also some common mistakes that native speakers can find very annoying like “were”, “we’re” and “where”. I make these mistakes a lot in my typing but it is important to remember to use the correct one. Another one is “there”, “their” and “they’re”. They are common mistakes because all these sound the same but if you get them right it will be a lot more pleasant for people to read your piece. So when you check these things your text will probably be a lot more readable and comprehensive. A correct text will be a lot more shareable and believable. Also, for business Emails always check if you’re addressing them right and use the right greeting and end the letter or email correctly. I like to use this overview so I get these things right. I like to use some basic tools to check my stuff apart from my spellings checker and proofreading. Firstly, Google translate. Who doesn’t use this? I think it’s amazing for when I know what you what you want to say in your own languages and have trouble translating. Do however check all translations and pick the best one and not just the first one that pops up. Second, a dictionary. Am I old-fashioned? Maybe, but a dictionary often as the most accurate information. It also often has not only the meaning of a word but also an example which can make it easier to get the nuance of a word. Lastly, If you want to get very fancy you can invest in a simple Grammar guide. Sometimes I forget how the most simple rules go or I simply am in doubt. I like to have a grammar guide to just look it up sometimes. I do prefer books over the internet for these things because you can choose the best overview for you. Maybe you still have a grammar guide from school which you already learned how to work with or your notes. I think that overall it’s just a matter of checking yourself and you’re writing a lot. Everything will get better the more you do it. You can find a lot of online resources to learn English. If you can write whole sentences then you are already quite far. In blog posts, you can always go back to change a word or to correct mistakes like I did in were I changed a to an. A tiny mistake in a business email will probably not end your career. As long as you try to stay polite and kind you will come a long way. You just have to do the extra steps. Don’t make it too complicated. Simple words and sentences decrease the change on mistakes and they are easier to follow. You also are more accessible for other people who’s English is not fluent. Do not use big fancy words if you can say is simpler. You are just risking using them wrong entirely. Keeping it sweet and simple makes it easier to read for everyone. I hope this was use full for some of you and that it helped. Yes, this will probably be littered with mistakes. I just have to keep learning. If you have any tips, tricks or tools then please let me know in the comments below. You can read about how my first two weeks in business were here. first i want thanks you … it is interesting topic for all of us ( non native english speaker ) your tips is really awesome , there is a way which i usr for my blogging it’s really awesome and automatic Apps ,it will help any one in any part of difficulty ,that’s is grammerly.com .this is free apps ,which every body use nowadays..i want you to check this out and Write best article on this automati capp for all of our friend (non english native speaker )…thank you ,very much . yes i use it even in my chating ,it’s awsome ,you should write best article on this helping apps . thanks .you are good at writing . It is so handy! I already love it and I only used it for a few hours! Thank you so much and thank you for your​ compliment! I’ve often been amazed by bloggers that write in English even if they don’t speak it or it’s not their first language. I love that you’ve posted tips for other bloggers to use.